We manufacture and export non-ferrous alloys that are preferred by a plethora of jewellery manufacturers. Our offerings include jewellery alloys granules such as Brass for vacuum casting, brass for open casting, oxygen free copper, alloy for silver and alloys for gold. We ensure that there are no impurities or foreign elements in our jewellery alloys. Our tolerance for them is much stricter than what is currently required by International standards. 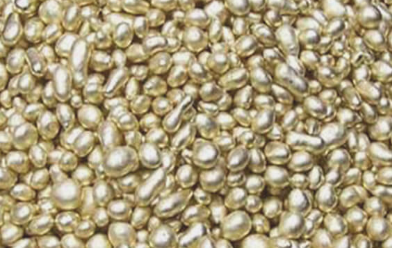 We export jewellery alloys that have good tarnish resistance. Also, as one of the best jewellery alloys suppliers and exporters, we offer alloys that are ecologically friendly. No nickel or hazardous metals such as lead or cadmium are used in the manufacturing of these alloys. Bright Metals are pioneers in the field of non-ferrous metal processing and have been a leading name in the industry for more than four decades. Established in 1968, the company is run by the third generation of the founders.Our exceptional material quality and unfaltering commitment towards development has made us one of the premiere names in the copper alloy industry. Our deep understanding of the various customer needs, our constant desire for innovation and cutting edge technology, have enabled us to deliver successfully and be a name of great repute and faith. Our extensive range of copper based alloys and excellent quality products has an outstanding record in diverse industries and applications. We work with our customers in identifying the appropriate alloy for their every need and our product quality and customer support ensures a satisfied and happy customer. Three generations worth of knowledge and experience being passed on is one of the premiere reasons for our success. Specialists in producing and manufacturing Brass Ingots for the faucet industry, we are the also the largest producer of these ingots in the Indian sub-continent. Through advance R&D, quality, reliability and excellence, Bright Metals has been able to carve a niche for itself in the industry. An ISO 9001: 2008 certified company, we believe in preserving and nurturing the environment. We are committed to quality and focus on providing our esteemed customers with a quality of material which is the best in the industry, on-time, every-time.